Green Structure Plan actions aim at sustainable urbanisation: less and slower traffic, climate- and energy-neutral construction, efficient water management and green areas for pleasant and healthy urban living. Utrecht wants to be a city where a healthy living environment and sustainable growth are core values. The updated Green Structure Plan 2017-2030 aims at making better use of green and blue infrastructure and restoring ecosystems. For instance, the role of trees in improving air quality, reducing urban heat island effect, and capturing CO2; or the positive influence of living nature for a healthier city, are some of the benefits foreseen by the Plan (UGSP, 2017). Another key to boosting green space is the 2009 tree policy. This explains how the city uses trees in urban development. Trees are considered to have their own spatial dimension and problems that merit specific policy on such matters as tree structure, instruments, and guidelines for their management and maintenance (Green Surge, 2015). This is based on the ecological, recreational, cultural-historic and spatial values of urban green space in and around the city. 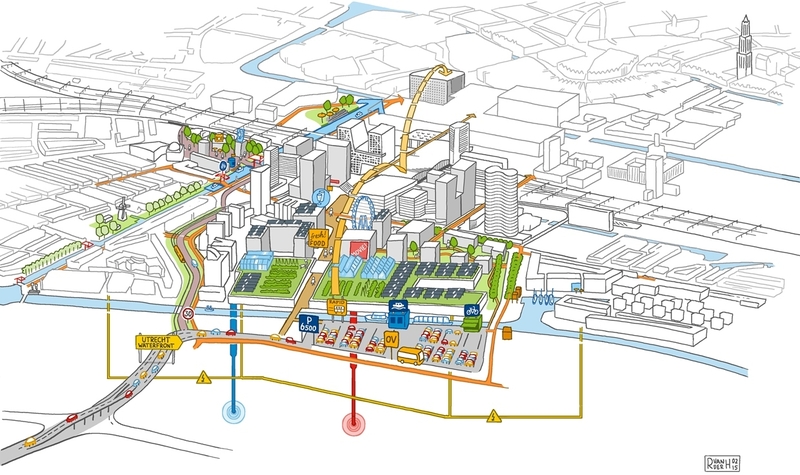 The new Central Station Area is one of the Netherlands’ major transformation projects and is included in the Smart Sustainable Districts (SSD) consortium as part of the Climate-KIC initiative. Nature-based solutions, such as green roofs and stormwater retention measures, directly contribute to climate change adaptation targets and, together with energy efficiency and renewable strategies, to the district’s sustainability. Through the new Leidsche Rijn housing development, Utrecht is expected to build 30 000 houses, 770 000 m2 of commercial office space, and a 230 ha business area by 2030. The district’s water systems are based on extensive use of SUDS (sustainable urban drainage systems) which includes stormwater management, water quality and natural infiltration beds (wadis). Utrecht has also introduced many greening actions within the city. The tree policy aims to create a wide and coherent green structure, not only to tackle environmental issues but to offer people green spaces for recreation and outdoor activities. As part of the Dutch Knowledge for Climate project (KvK), with the theme Climate-Proof Cities (CPC), a team of Wageningen University investigated the physical and psychological impact of street greenery in Utrecht (Klemm W. et al., 2015). • 10 % tree cover in a street lowers the mean radiant temperature by about 1oC. • People significantly appreciate street greenery in aesthetic terms. • People are consciously aware of microclimate conditions within street canyons. • Recommendation to use ample street greenery and extensive tree cover in street design. The Green Infrastructure Plan is connected with multiannual green programmes that specify in greater detail the measures to be taken on the priorities agreed, how those measures will be financed, and a planning schedule. Co-financing and cooperation are articulated as particularly important in the latest programme, particularly because of the restrictions on available funding due to the global financial crisis. The programme emphasises how cooperation with organisations such as the province, the municipal land corporation, the national government and the EU is important for investment in the green structure. Since 2009, green roofs on private houses and public buildings (schools) have increased to cover an area of 1 hectare. Investment in this totals EUR 550 000, of which EUR 250 000 came from the city council. The funding scheme will be continued, with more attention paid to the water storage capacity of green roofs. Since 2011, EUR 600 000 euro has been invested in tree infrastructure. From 2018 on, EUR 250 000 is available for this each year.